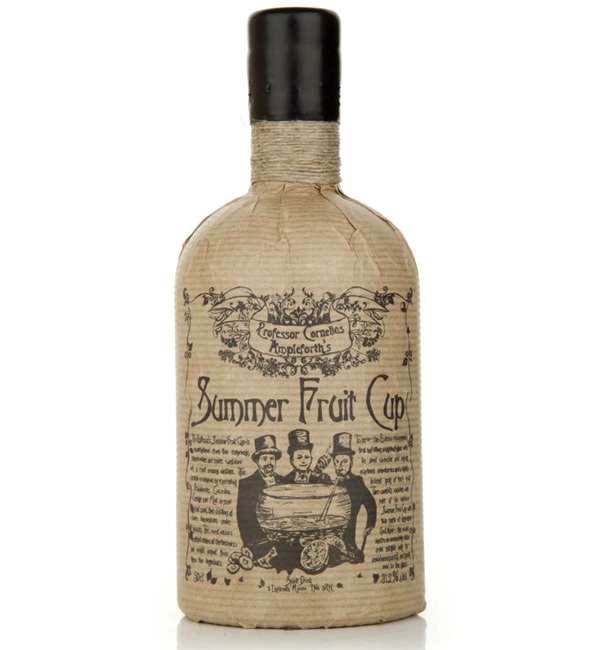 One of the UK’s leading online Whiskey & Spirit merchants (which you may remember from our feature of their “Origin Range” Single Estate Gins) are pleased to announce the launch of their Summer Fruit Cup. This ultimate English summertime drink is a product of Professor Cornelius Ampleforth‘s use of a vacuum sill which allows distillation of quality wheat spirit to take place at room temperature. The result is the retention of the complexity of this refreshing concoction which is infused with strawberries, cucumber, orange and mint with a blend of added fine wines, spirits, herbs and spices. To enjoy this summery intoxicant, the Professor recommends first half-filling a highball glass with ice, sliced cucumber and orange, quartered strawberries and a lightly bruised sprig of fresh mint. Then finish off the beverage with one part of Summer Fruit Cup and two (definitely not three) parts lemonade. For your aesthetic pleasure, each bottle is wrapped in brown crinkle paper with a string wound neck and black wax seal. And of course, let’s not forget the hand drawn illustration of three Victorian gentlemen having a jolly good time over a large bowl of summer fruit punch. If you’re feeling a bit thirsty you can order this boozy summer time beverage for £25, or approximately $40 USD. Nose: Huge depth and richness in the initial nose, spicy with notes of Caramelised Apricot, Chocolate and Marmalade. A huge secondary whack from the cold-distilled botanicals – Cucumber is the primary component, but mint, orange and sweet luscious strawberry all make an appearance. Palate: Extraordinary intensity, but made fresh and accessible by the cold-distilled botanicals. The Strawberry is particularly prominent, but the mint freshness is omnipresent. Finish: Long and luscious with the Mint, Strawberry, Orange peel bitterness and mint continuing to shine.